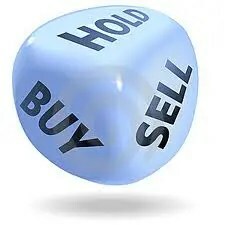 It is always hard to know what to buy or sell let alone just when to do so. Thank goodness there are indicators available that provide such information. Below are descriptions of the 7 most popular trend indicators: Crossovers; Moving Average Convergence Divergence; Percentage Price Oscillator; Keltner Channels; Parabolic SAR; Traders’ Index; and Advance/Decline Line. The price movement of a security over time is most easily analyzed by observing how its moving averages are trending. Either a simple moving average (where the movement during a specific time period is divided by the days of that time period) or an exponential moving average (where a mathematical formula gives greater emphasis to the more recent price movement) can be used and any period of time (up to 360 days on the various fine charting sites) can be studied. The most common short-term time period is 20- or 21-days using an exponential moving average (ema), while the most popular medium-term periods are the 39- or 40- and 50-day using a simple moving average (ma). To observe the long-term trend of the price movement of a security a 200-day ma is usually used and occasionally a 100-day ma. That being said, a large number of variations have been developed to satisfy particular needs and situations. – used to forecast the future movements in the price of a stock such as when a stock or index moves above (bullish) or below (bearish) its 20-day moving average. When a security’s long-term moving average (e.g. 50-day ma or ema) moves above its short-term moving average (e.g. 20-day ma or ema) it is referred to as a Death Cross and indicates a bear market on the immediate horizon, especially when it is reinforced by high trading volumes. Conversely, when a security’s short-term moving average moves above its long-term moving average, coupled with high trading volumes, it is referred to as a Golden Cross and indicates a bull market on the immediate horizon. – a trend-following momentum indicator of the exponential moving average (ema) of a stock or index which is used to identify short-term momentum. Specifically, the 26-day ema of a stock or index is subtracted from the 12-day ema to show an intermediate trend line. A 9-day ema, the ‘signal line,’ is then plotted over that intermediate term line to identify when to buy or sell the stock or index. When the resultant MACD falls below the signal line, it is a bearish signal, which indicates that it may be time to sell. Conversely, when the MACD rises above the signal line, the indicator gives a bullish signal, which suggests that the price of the asset is likely to experience upward momentum. Many traders wait for a confirmed cross above the signal line before buying or selling to avoid doing so too early and thereby avoid being ‘faked out’. Traders also watch for a move above or below the zero line because this signals the position of the short-term average relative to the intermediate-term average. When the MACD is above zero, the short-term average is above the intermediate-term average, which signals upward momentum. The opposite is true when the MACD is below zero. The zero line often acts as an area of support and resistance for the indicator. – similar to the MACD but while the MACD shows the simple difference between the 2 exponential moving averages the PPO expresses this difference as a percentage which allows a trader to compare stocks with different prices more easily. For example, regardless of the stock’s price, a PPO result of 10 means the short-term average is 10% above the intermediate-term average. That makes it much easier to choose one stock over another should the need arise. – moving average bands/channels where the upper line represents the average high of a security over a 10-day period; the lower band the average low of a security over a 10-day period and the centre line the closing price of a security over the same 10-day period. The trader is to sell the security when the closing price exceeds the upper band and to buy the security when the closing price falls outside the lower band. Like the other indicators mentioned it is best to add two or three other indicators to one’s charts to confirm any buy/sell signal. – used to determine the direction of a security’s momentum and the point in time when this momentum has a higher-than-normal probability of switching directions. The parabolic SAR is shown as a series of dots placed either below a security’s price on a chart (a bullish signal causing traders to expect the momentum to remain in the upward direction) or above (a signal that the bears are in control and that the momentum is likely to remain downward). As the price of the security rises, the dots will rise as well, first slowly (i.e. spaced well apart) and then picking up speed (i.e. getting closer and closer together) and accelerating with the trend. This accelerating system allows the investor to watch the trend develop and establish itself. The SAR starts to move a little faster as the trend develops and the dots soon catch up to the price line and that is when it is time to buy the security. A sell signal is triggered when the price line moves below the lower dot enabling an investor to position a stop-loss order. The ability for the parabolic SAR to respond to changing conditions removes all human emotion and allows the trader to be disciplined. On the other hand, while the SAR works extremely well when a security is trending, it can lead to many false signals when the price moves sideways or is trading in a choppy market. That being the case, it is paramount that other indicators such as the stochastic oscillator, moving averages, etc. be used to ensure that all information is being considered. – a short-term breadth indicator which measures the ratio of advancing stocks to declining stocks and compares it to the ratio of advancing volume to declining volume. When advancing volume exhibits discordance with the raw number of advancing stocks, the all-important sell signal is given. Conversely, when volume on the downside increases out of proportion with the number of declining stocks, an upside reversal is said to be imminent. It is important to note that TRIN is handled differently in each of the different market conditions. In a bull market, the overbought line is placed at 0.65 or 0.70 but in a bear market at 0.70 or 0.75. The oversold line is placed at 0.90 or 0.95 in a bull market and at 1.00 or 1.10 in bear markets. Assuming the market has been correctly identified as a bull or a bear and the overbought and oversold lines have been correctly placed you should buy when the current TRIN crosses above its oversold line and sell when TRIN sinks below its upper overbought line. When interpreted properly, TRIN can be one of the most powerful and accurate means of assessing the psychology of the market. – used to confirm the strength of a current trend and its likelihood of reversing. If the markets are up but the A/D line is sloping downwards, it’s usually a sign that the markets are losing their breadth and may be setting up to head in the other direction. If the slope of the A/D line is up and the market is trending upward then the market is said to be healthy. Thanks for reading! If you want more articles like the one above register to receive our FREE bi-weekly newsletter (see sample here , sign up in top right hand corner). Could there be some place you could get more info?